The U.S. intelligence chief warned on Friday that the threat was growing for a devastating cyber assault on critical U.S. infrastructure, saying the “warning lights are blinking red again” nearly two decades after the Sept. 11, 2001, attacks. Of the four, “Russia has been the most aggressive foreign actor, no question,” he said. The indictment and Coats’ comments came three days before U.S. President Donald Trump was to meet Russian President Vladimir Putin for talks in Helsinki, Trump’s first formal summit with Putin. Coats warned that the possibility of a “crippling cyber attack on our critical infrastructure” by a foreign actor is growing. He likened daily cyber attacks to the “alarming activities” that U.S. intelligence agencies detected before al Qaeda staged the most devastating extremist attack on the U.S. homeland on Sept. 11, 2001. “The system was blinking red. Here we are nearly two decades later and I’m here to say the warning lights are blinking red again,” he said. “However, we fully realise that we are just one click away of the keyboard from a similar situation repeating itself,” Coats continued. Coats cited unnamed “individuals” affiliated with the Internet Research Agency, the St. Petersburg-based “troll factory” indicted by a federal grand jury in February as part of Special Counsel Robert Mueller’s investigation into alleged Russian election meddling. These individuals have been “creating new social media accounts, masquerading as Americans and then using these accounts to draw attention to divisive issues,” he said. 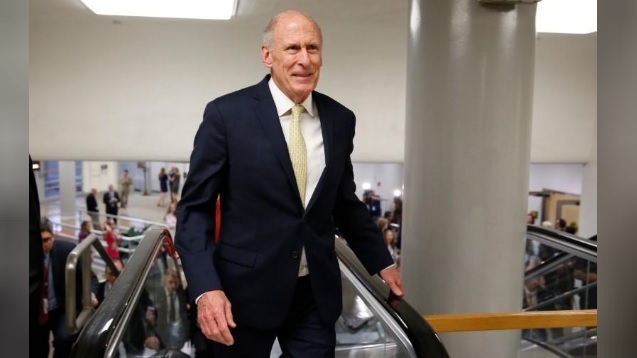 China, Coats said, is primarily intent on stealing military and industrial secrets and had “capabilities, resources that perhaps Russia doesn’t have.” But he said Moscow aims to undermine U.S. values and democratic institutions.